The main point of this letter is to affirm that I support the efforts that many companies now spend on developing new instruments, including efforts in copying the essential “stuff” of the York tubas that the Chicago Symphony owns. Both of those instruments are unique in their sound to this day. There have been valiant attempts at copying that sound and some manufacturers have come eerily close in those efforts. The fact is that the sound of the CSO York tubas are still unique. I am the zookeeper for the York tubas and my chosen professional responsibility is to expose these instruments and have them tested against other copies whenever requested. I have done this numerous times over nearly three decades. Big Mouth Brass, Eastman, Hirsbrunner, Kanstul, Nirschl, St. Petersburg, Wessex, Yamaha, etc., etc., have come to Orchestra Hall, to sites at Ravinia and tests in Tokyo, Redlands, Luzern (Switzerland), and other places to do tests. Some of those tests are requested to be private. Some are public. No matter. If this will help out an end product, I am all for it. Is it a cop-out for me to not say which instrument is closest to the York? Maybe. But I am truly conflicted as I tend to not part with any instruments. There are aspects of all of them that are commendable. Bedrooms in my house abound with instruments. In fact, an attempted robbery at our house several years ago was abandoned once the robbers saw the multitude of tuba cases in the basement. Their cursory glance probably thought those cases were coffins. The robbers thought they had broken into John Wayne Gacy’s other home!! They ran. Admittedly, I have a wonderful job in one of the finest orchestras on the planet. I have two beautiful instruments that I have the privilege of playing anytime I want and copies of those instruments many of which I have paid for myself. As long as there are manufacturers with a “sixth sense” that can capture the essence of the York sound, they are more than welcome to ask me to set up a test. I will do what I can do. Is there a link to that article, per chance? I would like to read it. Thanks for sharing how you feel about ongoing efforts to copy the sound of these two rare birds. Please keep that door open. I hope no one ever takes advantage of your kindness in this regard. I would really hate to see that door close to rest of us. As long as I have the time and we have the appropriately large acoustical space, my willingness to keep doing this will continue. Thanks for your interest. I just wanted to follow up on Gene’s post. 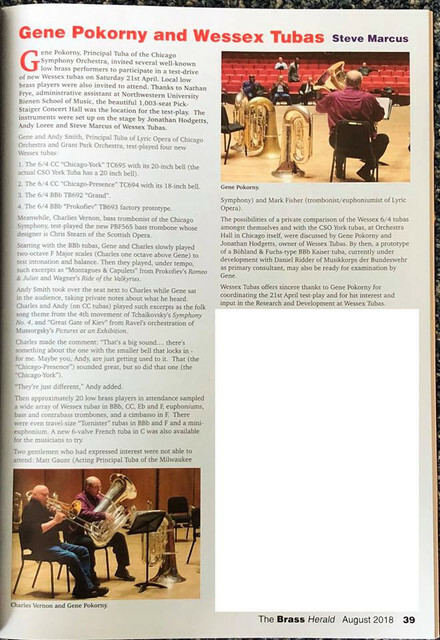 This last June I was honored to work with him at his Seminar at Redlands University and got a chance to compare one of the 2 CSO Yorks to a number of other tubas. One of which I liked so much I bought it. I’ve played both of the CSO Yorks over the last few years and have personally owned multiple copies of a few of them by various manufacturers. I’ve reviewed all of the most recent versions on my YouTube channel and have to say that the level of all of these instruments is nothing short of incredible. None of these would exist if it weren’t for Gene making the original progenitors of the “species” available to the intrepid souls that endeavor to replicate them...I for one can’t thank him enough for that. Because of his contributions to the art of tuba playing AND design I would have NEVER found my voice. THANK YOU GENE!! !